One of the first animal sounds Zoe ever made was for a kitty. Every time I take her to visit my neighbor, she immediately seeks out their cat Sammy and chases him around the room, giggling with glee. The old Disney cartoon, The Aristocats, is one of her favorites. 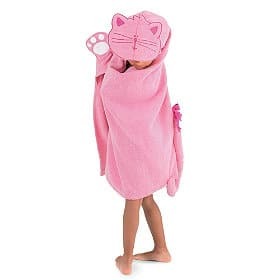 When I saw that Company Kids was offering adorable hooded towels for review, and a “Pink Kitty” was one of the choices, I knew it would be perfect for Zoe. 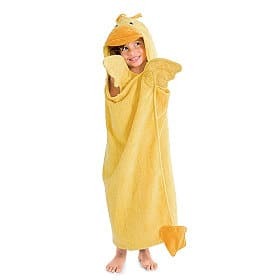 The hooded towels from companykids are a vast assortment that encourages kids to use their imaginations and role play. This adds a fun element to bath time, and also a way for me to coax my little bathtub fish back onto dry land. Zoe’s Kitty Hooded Towel is available in one size only. She is currently 2, and the towel reaches her ankles and completely envelops her so that I can get her dry sooner. She will definitely be able to enjoy this towel for several more years. It’s made from 100% cotton, is nice and cuddly, and most importantly from a parent’s perspective–it’s machine wash friendly. Currently the Pink Kitty towel is available on the website for $19.99. It’s definitely worth it! After I got Zoe out of the tub, I helped her try on her new towel. She looked absolutely adorable with the kitty face perched on top of her head, and her new tail swinging against her backside. I lifted her up to the bathroom mirror so she could see her new costume, and was rewarded with a string of delighted giggles. It made my day to see her so excited about something as simple as a bath time towel. I started looking around the companykids website just to see what other items for kids they have, and I easily found a few more things I’d love to order for Zoe, including a mermaid towel! I think this company is great for inspiring children to use their imaginations, and offering them great products with which to explore their childhood games even more. I love the pretty Preppy Stripe rug! I love the Mermaid Shimmer Percale Bedding. My little granddaughter just loves mermaids, and would love this bedding!